One of the greatest chairs ever created (and count your blessing if you do not need one to get around) the wheelchair is a wheeled mobility device in which the user sits. 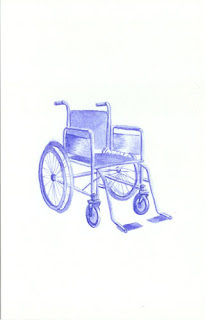 Records of wheelchairs date back to the 6th century, but it was Harry Jennings, a mechanical engineer, who invented the first lightweight, steel, collapsible wheelchair circa 1933. His coworker and friend Herbert Everest had broken his back in a mining accident and could not walk. The two men saw the enormous business potential of the invention, and went on to become the first mass-manufacturers of wheelchairs: Everest and Jennings. Their signature "x-brace" design is still in common use today.